Global demand for protein is booming partly due to rising incomes in emerging markets. Higher income also translates to consumers’ demand for improved organoleptic and nutritive quality, while shifting the diet preferences to include more protein, says Henk Hoogenkamp, Protein Specialist & Author. Consumers in the Western world are becoming more comfortable with plant-based proteins, which subsequently evolve as a central pillar of new product development. To service the surge in natural and or organic food products, the demand for alternative protein sources like rice, oat, canola, potato, and even mung bean are often outstripping availability. Drawing more protein from plants is an activity that has become a priority for specialty ingredient companies such as Cargill, ADM, DowDuPont, Roquette and Cosucra. Global pea protein isolate sales are expected to quadruple by 2025. A huge part of this sales increase is due to its use in plant-based meat products. ADM will be moving into the fast-growing pea protein market when their North Dakota plant opens up in 2019. ADMs pea proteins will have a minimum protein content of 80 percent, while pea starch and fibre will be secondary ingredients in their portfolio, probably directed towards the animal nutrition market. The global demand for plant-based protein in formulated foods is growing significantly and is forecasted to increase by eight to 10 percent per year. The rapid increase in plant protein ingredients is supported by changes in consumer preferences, including demand for healthier allergen-free and clean label nutrition, as well as sustainability and farm-to-fork traceability. Although the sale of pea protein isolate is trending and has become a formidable competitor to soy protein, the sales of its by-products—pea fibre and pea starch, does not see a similar growth curve. This imbalance is causing some friction in the optimisation on return-on-investment calculations and projected profitability for the pea protein category as a whole. The yellow pea (Pisum sativum) is a cool season crop that can be grown in many soil types. Compared to soy or corn, the yellow pea tolerates much colder weather conditions and can be harvested before the heat of the summer sets in. The yellow pea is universally considered a “defensive” crop when used in rotation with soy or corn. This is especially true for non-irrigated land with less than 50 cm annual precipitation, which indicated that the water use efficiency of the yellow pea is much greater. There is also anecdotal belief that corn crop yield is much higher for up to two years when followed by the yellow pea harvest cycle. It is also true that, when calculated in isolation, the yellow pea will not yield as well or as profitable as other main crops such as wheat, barley or canola. In India and China, the yellow pea is often grown in rotation with rice. The word “pulse” is a general reference to the dried seed of plants from the legume family, like yellow peas, green peas, chickpeas, and lentils. Pulses are often chosen for their healthy properties and ecological benefits. Pulses—including pea protein isolate, offer great nutritional inputs to the human diet and are devoid of the eight common allergens. Pulses are naturally high in protein and allow simple separation into the main fractions for protein concentration or isolation while maintaining good sensory properties. The pea plant is known as the crop that gives back to the earth more than it takes and producing it in a way that reduces negative impact on the environment. 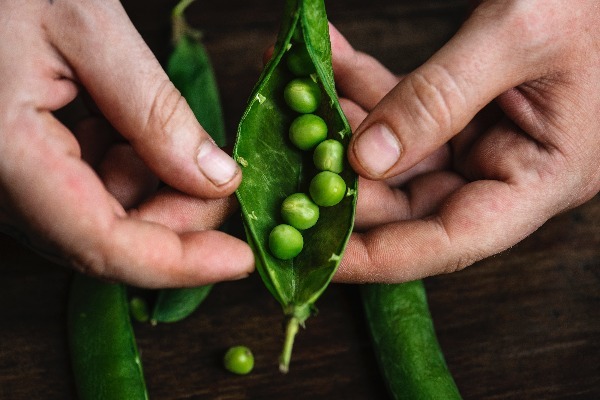 Peas can be grown both as a cover crop—cultivated before another plant species, or as a rotational crop, and thus, sequester carbon and add nitrogen to the soil. Both cover and rotational pea crops reduce the amount of fertiliser needed for the next round of harvest. The pea plant is considered an autogamous (self-fertilised) species like wheat because it does not need external pollen to be fertilised. Since the pea plant can draw nitrogen from the air, the crop does not require nitrogenous fertilisers, which is very beneficial for sustainable and ecologically sound agriculture. When used in rotation with wheat crop, significantly fewer greenhouse gasses are expelled, which will put less stress on the environment. Pulse plants also improve soil health and promote biodiversity. The crop uses relatively less water as compared to other protein sources, while reducing the need for nitrogen industrial fertilisers. Crop by-products from pulses can be used as animal feed to increase nitrogen concentration in the diet regimen. Pea protein is probably farthest ahead of the curve, offering excellent water-lipid linkage properties. Unlike soy protein, the yellow pea grown in northern Europe and North America is neither genetically modified nor is it on the list of major allergens requiring label warnings. Pea protein isolate has an amino acid profile close to that recommended by the FAO and WHO. This is because of its high levels of branched amino acids, glutamic acid, and arginine, as well as its richness in lysine. The little yellow round pea is highly digestible because of the elimination of anti-nutritional factors during its manufacturing process. Hence, pea protein isolate and textured products are an environment-friendly source of food protein, which is ideally suitable for sustainable or “green” food production. The pulse pea has its origins in southwest Asia dating some 10,000 years ago, and belongs to one of the earliest cultivated food crops. By the time the Middle Ages began in Europe, peas had provided main nutrition for some civilisations that based their basic nutrition on the availability of rice, wheat, pea, and soy. Prior to the Middle Ages in Europe, the pea (Pisum sativum) probably originated from the near East, especially in countries around the Mediterranean Sea, which created many regional dishes like paella and couscous providing protein and energy. At the lower end of the pulse spectrum is pulse flour, which typically contains protein ranging between 15 and 25 percent. These pulse flours are mainly used in food products like pastries, snacks, cereals, coatings, crackers, sauces and (gluten-free) cookies, while maintaining a more nutritious and natural profile. Higher in the hierarchy, there are pulse protein concentrates (65-70 percent) and pulse protein isolates (80 percent+) which are mainly used for protein enrichment, though also serve as organoleptic improvements like crispiness and colour diversification. Pulse protein is free from the nine main allergens. Pea protein is a popular choice due to the non-GMO status, as well as the hypoallergenicity and natural hexane-free processing. Pea protein ingredients offer a range of sustaining advantages, including no nitrogen fertilisers, ideal rotation crops, less irrigation, and uniquely allow natural water extraction protein isolation processes. One method to meet the huge increase in pea protein demand is to increase the protein content by either conventional or genetic modification. This way, the standard protein content in the yellow pea –ranging from 18 to 25 percent- can be increased to 28 percent. However, both conventional and genetic methods of crop breeding might be a stopgap measure, with cellular biotechnology emerging as the method of choice to manufacture sustainable protein to assure food security for the world population. Starting in 1990, the introduction took at least 20 years before pea protein finally got some recognition and arrived in the premier league of serious protein solution in 2010. Their hard work finally paid off and pea protein ingredients are now a welcome addition in the toolbox to create sustainable and healthy foods. It is estimated that the total world market for novel plant protein ingredients (pea, rice, potato, oat) will reach approximately 240 metric tons in 2018. Pea protein processing is quickly growing with new facilities prepared for significant capacity increase in France, Belgium and especially Canada, with China ready to join the club at any given moment. Of all novel protein ingredients introduced since 1990, only pea protein and rice protein (38 tons/year) can be currently considered a successful business model for the mainstream market. Potato protein production is estimated to be around eight tons per year. However, the manufacturing of both rice protein and potato protein ingredients will continue to increase in the next few years. Pea protein is particularly used in premium-formulated foods that target affluent consumers who are pro-actively looking for “natural and clean-label” products. These foods include (dry blended) beverages, cereals, nutri-bars, meat-free, and bakery products. The sudden rise in demand by both specialty and multi-national food companies has taken the pulse agri-growers and pea protein manufacturers off guard: AGT Food Canada, Roquette France, Cosucra Belgium, and Emsland Germany, have added pea protein manufacturing capacity. But pea protein growth doesn’t stop here. Global powerhouses such as Cargill—including its partnership with Puris breeding pea crops for higher protein content- ADM, Verdient Foods in Saskatchewan, Anchor Ingredients, and Canadian Protein Innovation are boosting pea protein capacity. Soy powerhouse DuPont has also gotten into the act and now introduced Trupro 200, pea protein concentrate. A number of soy processing facilities are transformed to produce protein concentrates and protein isolates from pea and other high-protein ingredients from pulses. Ingredion has entered a joint venture agreement with Verdient Foods, Canada to make pulse-based protein concentrates and flours from lentils and fava beans for food applications. Non-soy plant proteins are rapidly growing and extending beyond North America. The global market for non-soy gluten-free plant-based proteins is projected to be US$ 1.5 billion by 2022. Most likely, one or two mothballed soy protein facilities in China will be redesigned and commissioned to further increase the availability of pea protein isolate. For now, Yantai Shuangta and Jianyuan are the leading pea protein manufacturers in China. Canada will likely emerge as the premier basis for pea protein manufacturing. To capitalise on the growing demand for plant-based food ingredients for human nutrition, additional manufacturing facilities are required. For pea protein isolate, Canada will claim the number one spot by 2020 making up around 30 percent of the total global production. Canada is the world’s powerhouse of the yellow pea production totalling some 1.5 million hectares, compared to 0.6 million hectares for the US, 3.1 million hectares (2018) globally. In comparison, the US state Montana has become the largest producer of crops like peas, lentils and chickpeas, and the hectares of pulse crops harvested there has tripled (2010-2018), making it the largest crop. Both China and India cannot meet their domestic demand, hence, they need to rely on imports from the US and Canada. Despite all positive agricultural benefits of the yellow pea crop, there are a few negatives that come occasionally into play. Compared to soy and corn, the yellow pea is more difficult and time-consuming when harvesting. The pea plants often die within 24 to 48 hours during heavy rainfall, when creating waterlogged conditions. Saline soils should be avoided, and seed rot in the field can occur due to fusarium fungicide (fungus), mildew, and insect (grasshopper) infestation. In very basic terms, pea protein isolate is made from yellow peas mixed with water and spun at high speed through stainless steel drums, separating the protein from starch and fibre. While the market compared to the soy protein industry remains relatively small, pea protein has become America’s poster child as a plant-based favourite and gluten-free ingredient for the health-conscious consumer. The once lowly yellow pea from the middle classes in China has become the moneymaking ingredient for companies in search of higher profit margins, compared to the bigger commodity crops such as corn, wheat and soybeans. For food formulators, the term “high protein content” typically identifies ingredients with a protein content ranging from 60 to 95 percent by dry weight. Examples are soy protein concentrate and soy protein isolate. The soluble fraction of pea protein is about 85 percent of the total protein, of which the globulins are the main storage proteins of the plant. The albumins consist of molecules that mainly have a functional role in the seed. The balance—15 percent consists of insoluble proteins. The salt soluble globulin proteins represent between 65 to 80 percent of the total analytical pea protein. The pea protein albumins have a low molecular mass that is soluble in water and rich sulphur-containing amino acids. Their amino acid composition is more balanced than the globulin protein fraction, thus have a better nutritional status. The pea protein is rich in lysine and tryptophan and, in addition, has naturally-occurring high levels of iron. Much like functional soy protein ingredients, pea protein concentrate and isolate has an ability not only to bind water and fat, but also to assist or create properties such as dispersing, solubility, foaming, emulsification and gelling. Of course, these protein properties are depending on processing treatment—including the influence of specific enzymes temperature and pH. These parameters can be manipulated or modified to achieve the most ideal protein characteristics for the given application. Centrifuging the precipitated mixture using a decanter (i.e. Sharples) or plate separator to maximise the yield recovery of the precipitated proteins. Both wet processing by alkaline extraction (including the use of sodium hydroxide, NaOH) and acid precipitation, plate-frame ultrafiltration and dry processing of pea protein concentrate by means of fractioning are conventionally used. Especially dry fractioning is a cost-efficient method, suitable for the creation of pea protein concentrate. It is also important to note that the choice of an acidic, alkaline or neutral extraction and the enzymatic hydrolysis treatment process will directly influence the pea protein properties like foaming or emulsification or extrusion properties, including high moisture extrusion for meat analogues. Besides the technological application properties, the most compelling advantage of pea protein is probably its favourable labelling. Unlike soy protein, pea protein has a significantly higher degree of consumer relevance and acceptance. The jury is still out on how to justify the sudden surge in popularity, though it can be partly explained by the anti-soy bias of the American consumer. The increasing human allergy responses of soy, as well as its confusing health claims and hexane-processing methods, and the lack of a “natural” ingredient image might be other reasons. The main advantage of pea protein and other non-soy plant protein sources is the weakness of soy protein in terms of negative consumer perception. This continuing saga, especially in West Europe, probably dates back to the early years following World War 2. For some reason, the word “adulteration” was always part of the vocabulary when discussing soy protein. Sadly, this started after the war when the US soy industry tried to convince Europeans to eat “imitation meat.” Diluting meat content is one thing, but eating incredibly high levels of textured soy protein clearly was “A Bridge Too Far” for people who were still suffering from the emotional pain of hunger and distress. Pea protein manufacturers source their raw material from non-GMO yellow pea grown in North America and West Europe. The extraction is mainly a solvent-free method, based on an enzymatically-oriented fermentation process resulting in a high purity protein produced with no chemicals. Subsequently, the remaining protein contains few anti-nutritional factors like lectins, tannins, lipoxygenases and protease inhibitors. The yellow pea contains less trypsine inhibitors than soy. The presence of phytic acid is routinely removed when manufacturing pea protein isolate. Modern protein extraction and isolation allow solvent-free and hexane-free processing while maintaining an all-natural status. The demand is especially growing in North America and the UK. Pea protein concentrate or isolate is available at varying gel strengths for several food applications. For meat applications, pea protein isolate can replace soy isolate on a weight-for-weight basis with little to no performance or organoleptic differences. The main restriction with the use of pea and lupine protein is their taste difference, depending on the botanical origin, as well as the inadequate processing methods to clean up persistent odour and sensory notes. There are still slight barriers to pea protein due to its inherent flavour profile. For flavour-sensitive applications like plant milk products, yogurt, cheese-analogue, formulated beverages and protein shakes, the use of plant proteins is still somewhat restricted due to flavour and odour limitations. Ever since the relative world shortage of pea protein started in 2013, pea protein manufacturers have started to de-emphasise its use in formulated meat products and are focusing instead on premium value applications like high moisture extrusion for vegetarian foods, powdered or ready-to-drink, and sports nutrition. Pea protein is ideal when combined with other plant-origin ingredients, such as wheat and rice proteins, although a blend using whey protein, egg protein, and soluble rice protein is a better solution to improve nutrition profiles. Another interesting development is the combination of pea protein and rice protein fermented using shiitake mushrooms. These emerging proteins—made by Myco Technologies (USA), can serve as an ingredient to reduce bitterness in coffee and chocolate, as well as improve emulsification in formulated meat products. These combined proteins provide superior and easily digestible nutrition at attractive price points. The pea pulse not only delivers high quality protein, but also gives functional dietary fibre and starch for clean-label and wholesome food products. Taste and texture are the attributes with which to convince consumers that they can find appetising plant meat solutions, and this trend in plant-based foods are not slowing down anytime soon. Extruded intermediate plant proteins and structured ingredients containing pea protein, both available in semi-moist or dehydrated forms, are increasingly used as an alternative for soy and have demonstrated properties that mimic meat. For example, Roquette’s Nutralys T70S (France) and FoodFlow’s TuraPea (Philippines) are fibrous textured pea protein ingredients, specifically developed to simulate meat-like texture, including the best-selling Moving Mountains Burger 12 in the UK.